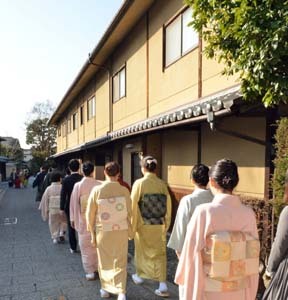 The Urasenke Tankokai Seinenbu (Youth Division) is a membership organization for Urasenke chado devotees who are under fifty years of age. The three pillars of its activities are "Training, Service, and Friendship." 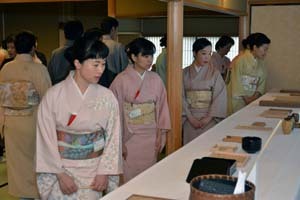 Its members find joy in their involvement with meaningful activities which reflect the spirit of chado, the "way of tea." 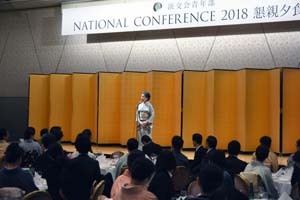 March 2-4, 2018, Urasenke Tankokai Headquarters sponsored its 3rd Seinenbu National Conference. The theme this time was "Pride and Passion." 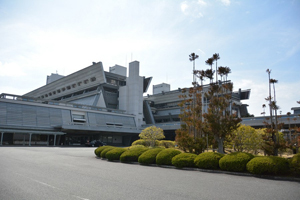 The main venue was the Annex Hall of the Kyoto International Conference Center (ICC; former name, Kyoto International Conference Hall, KICH), located in the northern section of Kyoto City. 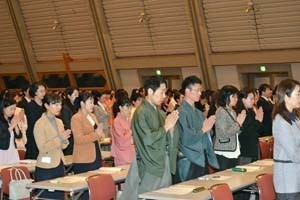 The participants came from all corners of Japan and numbered 594, including 18 who were invited by the Urasenke Student Chado Research Group (Urasenke Gakusei Chado Kenkyukai) and the Miyagi Student Chado Federation. 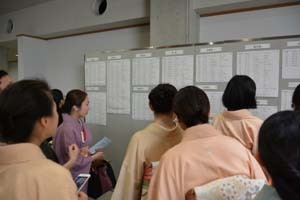 The reception desks in front of the ICC Annex Hall opened at 11:00 A.M. Once the attendees checked in and received their conference programs and tickets, they could browse through the photos and other PR materials pinned up in the lobby, which the various Seinenbu regions and chapters had sent in to introduce themselves and show what they had done for the conference pre-event project, the "Itterasshai Chakai" (Cheerio Tea Get-together). 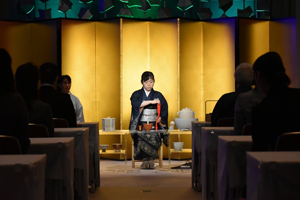 During the time before the opening ceremony, the attendees could have a bowl of usucha (matcha tea of relatively thin consistency) at one of the two tea service venues which had been set up to welcome them. 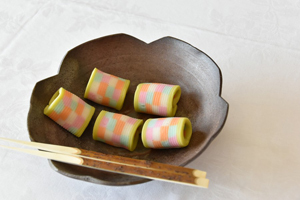 Their "tea service ticket" indicated which venue was awaiting them: the "East Tea Venue," hosted by four regional Seinenbu blocks roughly located in eastern Japan, or the "West Tea Venue," hosted by four roughly located in western Japan. Also, they could go to check out the items at the charity bazaar, and place their name on an application for any they wanted to purchase. 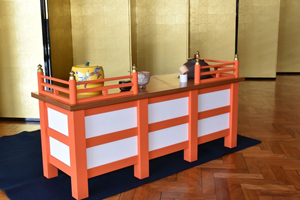 The items had been donated by the Urasenke Head House, priests, craftsmen, companies, various regional Seinenbu blocks, and others, and the proceeds would be used to help disaster-stricken areas in Japan and the victims of those disasters. 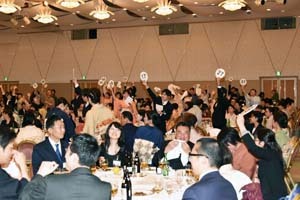 Those who participated in this fund-raising event were given a raffle ticket to possibly win a prize at the social event that evening. This began at 2:00 P.M. on March 2. 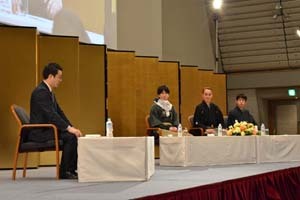 Those who were seated on the stage included Daisosho SEN Genshitsu, Iemoto SEN Soshitsu and his wife, Mrs. SEN Masako, and other members of the Urasenke Head Family, top members of the Konnichian Corps of Deputy Tea Masters (gyotei sensei), and top Urasenke Headquarters Office of Management officials. 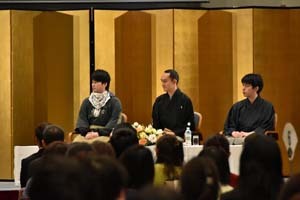 Also, the distinguished guests seated on the stage were Kyoto Prefecture Governor YAMADA Keiji, and Kyoto City Mayor KADOKAWA Daisaku. 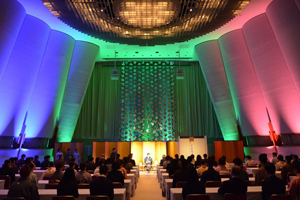 It began with the auditorium darkened for a big screen slide show of scenes from the pre-convention event, the "Itterasshai Chakai," in which the Seinenbu groups throughout the country had taken part. 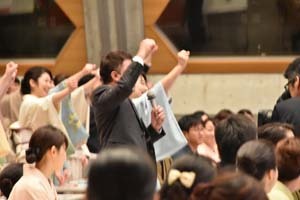 Following the intoning in chorus of the Urasenke Followers' Statement of Goals, there were introductions of the sixteen regional Seinenbu blocks, each of which was represented at this convention, and which had thought up a special message to convey at this time. 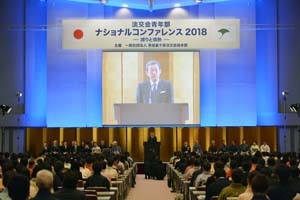 Next there were opening speeches by Daisosho and then Iemoto, a welcoming speech by the Convention Executive Committee Chair, YUKIMATSU Hironobu, and congratulatory speeches by Governor Yamada and Mayor Kadokawa. 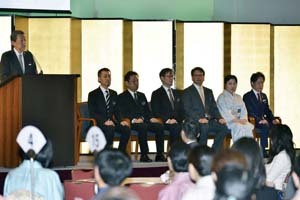 Also, the MC read aloud a congratulatory message which had come from Prime Minister ABE Shinzo. 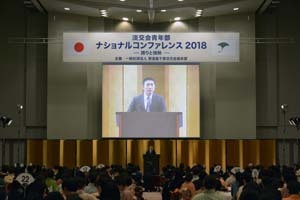 Following the Convention Opening Ceremony, from 3:00 P.M. Daisosho delivered a potent 50-minute talk which centered on the theme of "working hard to till the field that you were given when you were born." 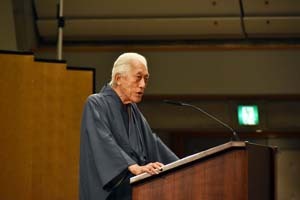 Within that theme, he described many events during his life in his hard fight tilling the field that he inherited, the Urasenke tea field. 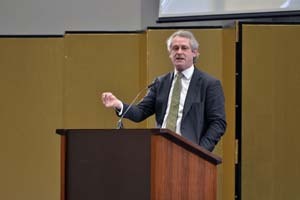 From 4:00 P.M., guest speaker David Mark ATKINSON, who has resided in Japan since 1990, formerly was a bank analyst who rose to the position of Partner at Goldman Sachs, retired at age 42, and now is not only President and CEO of a three-hundred-year-old company specializing in the restoration of the lacquer and other artistic decoration work on National Treasure and Important Cultural Property buildings in Japan, but is also a keen and very active Urasenke chanoyu practitioner, presented the keynote speech for this conference. 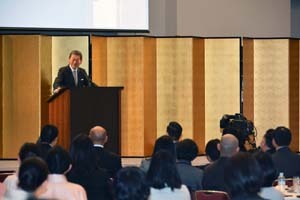 His speech, in tune with the conference’s main theme, "Pride and Passion," brought together his astute insights and recommendations on Japan’s approach to its invaluable heritage, his thoughts about chanoyu, and his appeal to young Japanese chanoyu enthusiasts. 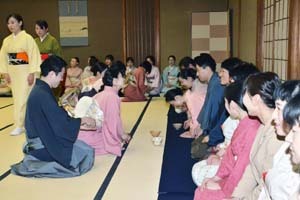 His appeal to them was for them to delve into the activity of hosting chaji (formal tea functions). 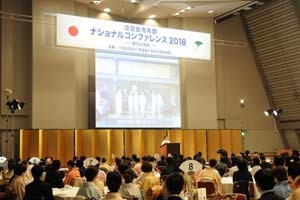 In the evening on this first day of the convention, there was a social event from 6:00 P.M. at the Grand Prince Hotel Kyoto, located across the street from the ICC. 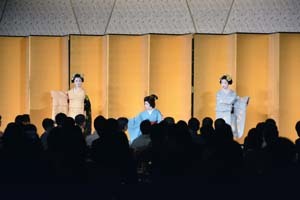 Adding special Kyoto color and flavor to it was the presence of maiko and geisha entertainers, who performed a Japanese dance for the opening entertainment. 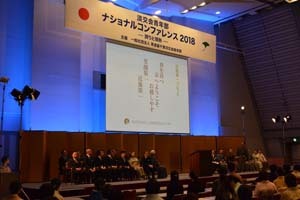 Following that, SEN Masako, presented an opening address, and then SEN Takafumi, the son of Iemoto and Mrs. Sen, came to the stage and raised a toast. 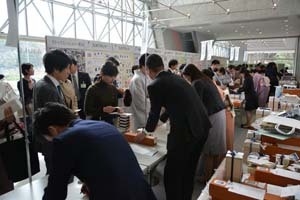 As the attendees enjoyed the food and drink that was brought to their tables, they were encouraged to also walk around and exchange name cards. The name card exchanging was part of a word game that had been devised as a social entertainment for this evening. 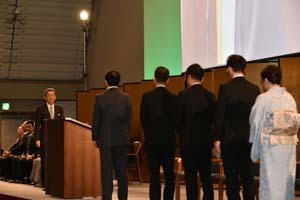 Another exciting activity was the raffle game, for which SEN Takafumi and his cousins IZUMI Koichiro and IZUMI Reijiro did the honors in doing the ticket drawing and presenting the prizes. 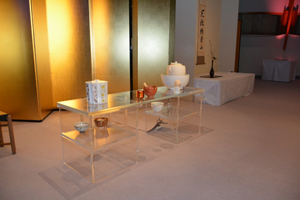 Returning to the ICC, the groups sat together at round tables in the main hall from 1:00, for the "Group Tea Service" event which they had made preparations for in advance of the conference. 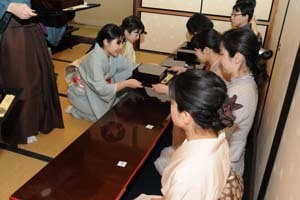 Each table had its own unique assemblage of implements, decorations, and confections, for the group members to make usucha for each other and get further acquainted. 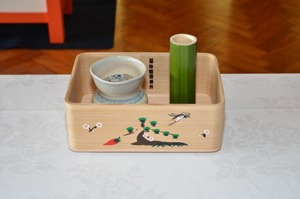 The matcha tea powder they used were favored blends of Iemoto Zabosai from various tea production centers in Japan. This hour-long event ended with oral and visual introductions of some of the groups' study and training activities that morning. 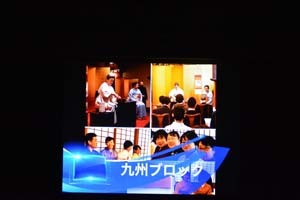 Iemoto Zabosai was scheduled to present a talk from 2:00. 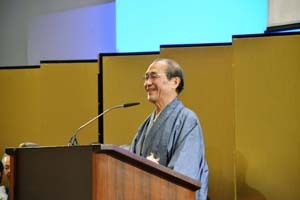 First, however, IZUMI Koichiro came onto the stage and presented a short unscheduled speech, to say how much he was impressed by the previous day's keynote speech by David Mark ATKINSON. 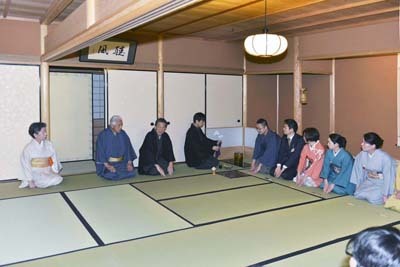 He echoed Atkinson's closing words, urging Seinenbu members to be active in hosting chaji, especially intimate ones for people who may be unfamiliar with the Way of Tea, so as to keep alive Japan's heritage. 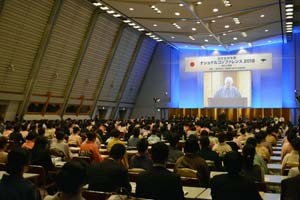 Iemoto Zabosai's forty-minute talk, following that, also contained much praise for the previous day's guest speaker. 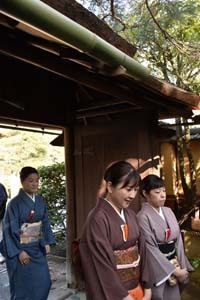 It also covered such issues as people's need to develop a good sense of suitable distance and timing (maai) in our relations with others; the growing importance of sincere, trustworthy human connections in the world of the future; and the power of culture and the Way of Tea in these and other fields of concern. 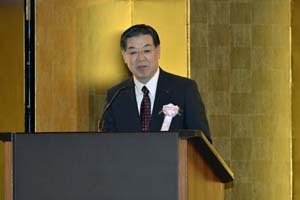 For the next forty minutes, SEN Takafumi (b. 1990), KONGOH Tatsunori (b. 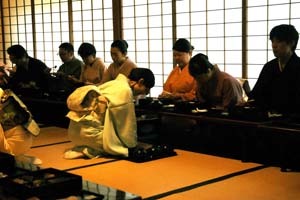 1988; eldest son of the present, 26th-generation head of the Kongoh tradition of Noh), and RAKU Atsundo (b. 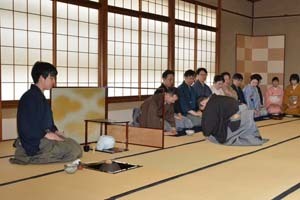 1981; eldest son of the present, 15th-generation head of the Raku tradition of pottery) sat together on the stage for a talk session, with IZUMI Reijiro serving as coordinator. 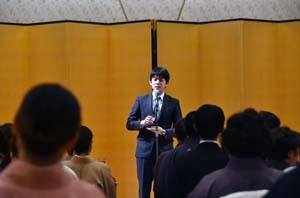 Questions had been gathered in advance from the Seinenbu members, for the coordinator to ask these three young men who each, respectively, would succeed their father before long as the hereditary successor of their family's artistic/cultural tradition which has been passed forward for many generations by their forefathers. The questions were: 1) When did you become aware that you had to become the successor, and after you realized that you did, were you happy? 2) How, as the successor, will you show your own character? 3) What do you consider is the main appeal of your artistic/cultural tradition? Their answers were amazingly different from each other's, largely due to the different natures of their arts, and the differences in their raising and other personal circumstances. 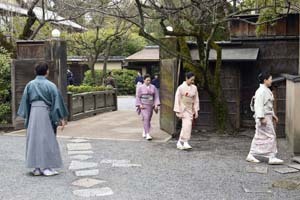 The three had been requested to come dressed in their usual work attire, and so RAKU Atsundo was wearing his heat protection kiln-firing attire. 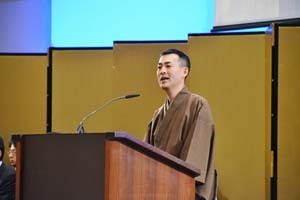 At the Convention Closing Ceremony, which took place from 4:00, Iemoto Zabosai delivered a closing address, and the Convention Executive Committee members expressed words of thanks to Iemoto Zabosai. The results of the winning applications for the charity bazaar were posted on the bulletin board, and those who had submitted winning applications could go to get the item and the payment form which came with it. 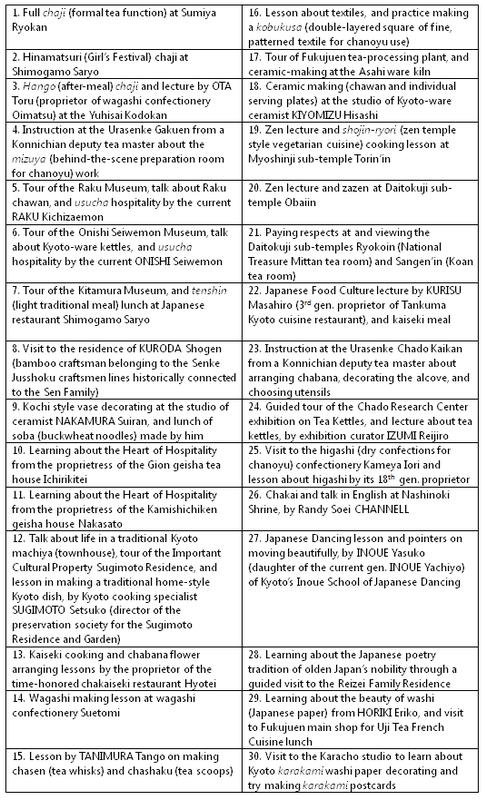 The remaining events on the convention schedule — a party hosted by the Convention Executive Committee at the ICC that evening, and a chakai hosted by the Urasenke Head Family the next day at Urasenke Konnichian — were offered as optional activities. 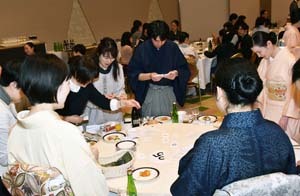 This fun-time party, which the majority of the convention registrants opted to take part in, was from 6:00-8:00 P.M. on March 3, and was in the form of a costume party organized by Seinenbu region. 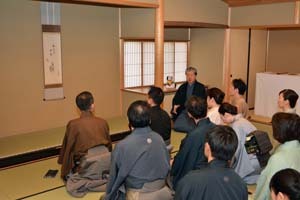 The majority of the convention registrants also spent one more night in Kyoto in order to take advantage of the invitation by the Urasenke Head Family to attend the chakai at Konnichian. 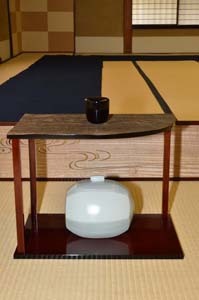 The chakai, consisting in a koicha venue hosted by Iemoto Zabosai in the Heisei Chashitsu, and an usucha venue hosted by SEN Takafumi and his cousins, IZUMI Koichiro and IZUMI Reijiro, in the Chado Kaikan located just across the street from the Heisei Chashitsu, took place from 9:00 A.M. to 3:00 P.M. on March 4. 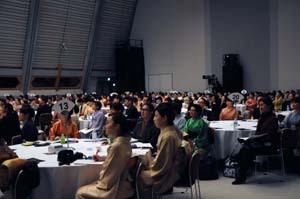 There were three seatings through the day for each venue. 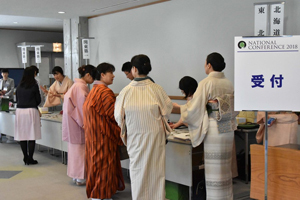 Those who had ordered the tenshin meal in advance were served that meal in the Urasenke Gakuen school building. 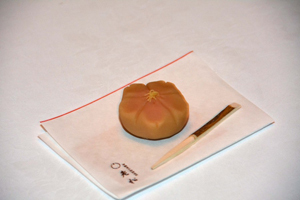 which are in a lacquered box on a lacquered tray, and the covered bowls of warm, simmered foods. 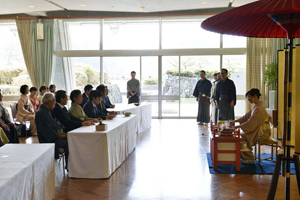 For most of the 2018 Urasenke Tankokai Seinenbu National Conference attendees, their participation in this special chakai at Urasenke Konnichian put the crowning touch on their conference experience this year.